We are manufacture of Dhoop Stick making machine. Machine Speed: 250 - 350 nos/minute (depends on size & Material). Required power: 3.5 HP, 3 Phase. Length Of Incense you can change cutting blade for different size. Production Capacity 200 Kg Per 12 Hrs. · Machine Speed: 200 nos/minute depends on size. · Required power: 2.5 HP, 3 Phase. · Hydraulic Oil : Required 50 liter (Client’s scope). · Machine weight: 300 Kg. Height of cone More than 3", 2" 3" 4"
Production Capacity 300-400 kg. /8 Hr. Height of cone 2" 3" 4"
Production Capacity: 300-400 kg. /8 Hr. Production Capacity: Production: 300-400 kg. / 8 Hr. 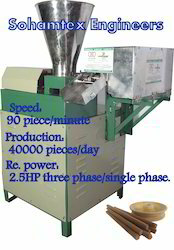 Machine Speed: 325 – 425 Kg./ 8 HR (depends on size Material). Required power: 3 HP, 3 Phase. 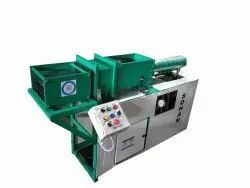 Material Filling capacity: 5 to 5.5 Kg. Power Capacity 3 HP,3 Phase. Machine design & working theory copyright by sohamtex engineers Machine Speed: 325 – 425 Kg./ 8 HR (depends on size & Material). Manual Cutting Length of Stick: 2 Inch to 8 Inch. Oil : Required 30 liter (Client’s scope). Lifetime payable service available Easy to operating & low maintenance. 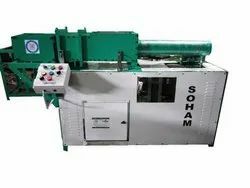 Wet Dhoop Stick Making Machine (Manual cutting, Multi cavity)Machine design & working theory copyright by sohamtex engineers Machine Speed: 325 – 425 Kg./ 8 HR (depends on size & Material). Electric control panel Operating. Required power: 3 HP, 3 Phase.Material Filling capacity: 5 to 5.5 Kg. Manual Cutting Length of Stick: 2 Inch to 8 Inch. Number of Cavity for 5/2 Die: 50 cavities (Lines) Hydraulic operating system with 25 tone capacity Hydraulic Oil : Required 30 liter (Client’s scope). Oil tank: 35 liters capacity Machine Size: 5.5 * 2.5 * 3.5 FEET Machine weight: 350 Kg. Free: contacts of raw material supplier, Training of machine operating and general maintenance. Warranty: 9 months on main motor and drive. Lifetime telephonic technical support free after sales. (9 AM to 6 PM, Thursday weekly off) Lifetime payable service available Easy to operating & low maintenance.Made in India. ¿¿¿¿¿¿¿¿¿¿¿¿¿¿ Hydraulic Oil : Required 30 liter (Client's scope). ¿¿¿¿¿¿¿¿¿¿¿¿¿¿ Machine weight: 350 Kg. ¿¿¿¿¿¿¿¿¿¿¿¿¿¿¿¿¿¿¿¿ Training of machine operating and general maintenance. Production Capacity: 355-400 Kg per 8 Hours.